The posterior abdominal wall is a complex region of anatomy. It is formed by the lumbar vertebrae, pelvic girdle, posterior abdominal muscles and their associated fascia. Major vessels, nerves and organs are located on the inner surface of the posterior abdominal wall. In this article, we shall look at the muscles and fascia of the posterior abdominal wall. 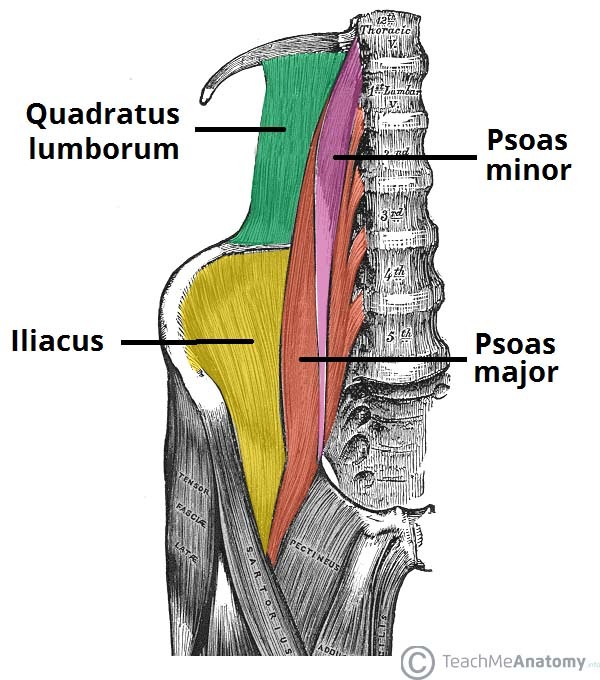 There are five muscles in the posterior abdominal wall: the iliacus, psoas major, psoas minor, quadratus lumborum and the diaphragm. 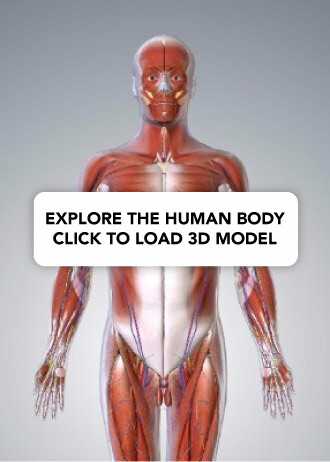 We shall look at the attachments, actions and innervation of these muscles in more detail. Fig 1.0 – The quadratus lumborum of the posterior abdominal wall. 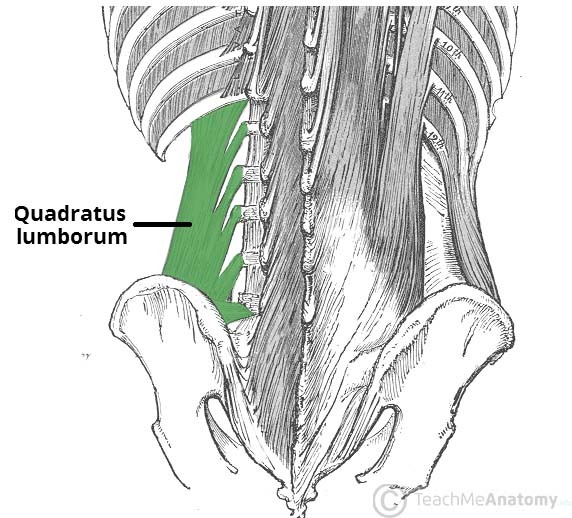 The quadratus lumborum muscle is located laterally in the posterior abdominal wall. It is a thick muscular sheet which is quadrilateral in shape. The muscle is positioned superficially to the psoas major. Attachments: It originates from the iliac crest and iliolumbar ligament. The fibres travel superomedially, inserting onto the transverse processes of L1 – L4 and the inferior border of the 12th rib. Actions: Extension and lateral flexion of the vertebral column. It also fixes the 12th rib during inspiration, so that the contraction of diaphragm is not wasted. Innervation: Anterior rami of T12- L4 nerves. The psoas major is located near the midline of the posterior abdominal wall, immediately lateral to the lumbar vertebrae. Attachments: Originates from the transverse processes and vertebral bodies of T12 – L5. It then moves inferiorly and laterally, running deep to the inguinal ligament, and attaching to the lesser trochanter of the femur. Actions: Flexion of the thigh at the hip and lateral flexion of the vertebral column. Innervation: Anterior rami of L1 – L3 nerves. Fig 1.2 – Muscles of the posterior abdominal wall. The psoas minor muscle is only present in 60% of the population. It is located anterior to the psoas major. Attachments: Originates from the vertebral bodies of T12 and L1 and attaches to a ridge on the superior ramus of the pubic bone, known as the pectineal line. Actions: Flexion of the vertebral column. Innervation: Anterior rami of the L1 spinal nerve. The iliacus muscle is a fan-shaped muscle that is situated inferiorly on the posterior abdominal wall. It combines with the psoas major to form the iliopsoas – the major flexor of the thigh. Attachments: Originates from surface of the iliac fossa and anterior inferior iliac spine. Its fibres combine with the tendon of the psoas major, inserting into the lesser trochanter of the femur. Actions: Flexion of the thigh at the hip joint. Innervation: Femoral nerve (L2 – L4). The posterior aspect of the diaphragm is considered to be part of the posterior abdominal wall. It is described in detail here. The psoas sign is a medical sign that indicates irritation to the iliopsoas group of muscles. The sign is elicited by flexion of the thigh at the hip. The test is positive if the patient reports lower abdominal pain. A right sided psoas sign is an indication of appendicitis. As the iliopsoas contracts, it comes into contact with the inflamed appendix, producing pain. A layer of fascia (sheet of connective tissue) lies between the parietal peritoneum and the muscles of the posterior abdominal wall. This fascia is continuous with the transversalis fascia of the anterolateral abdominal wall. Whilst the fascia is one continuous sheet, it is anatomically correct to name the fascia according to the structure it overlies. Quadratus lumborum – between the anterior and middle layers. Deep back muscles – between the middle and posterior layers. The posterior layer extends between the 12th rib and the iliac crest posteriorly. Laterally the fascia meets the internal oblique and transversus abdominis muscles, but not the external oblique. As it forms these attachments it covers the latissimus dorsi. The anterior layer attaches to the anterior aspect of the transverse processes of the lumbar vertebrae, the 12th rib and the iliac crest. Laterally the fascia is continuous with the aponeurotic origin of the transversus abdominis muscle. Superiorly the fascia thickens to become the lateral arcuate ligament, which joins the iliolumbar ligaments inferiorly. Fig 1.2 – The layers of thoracolumbar fascia. In the posterior abdominal wall, which muscle is located between the anterior and middle layers of the thoracolumbar fascia? Which of the following muscles is not part of the iliopsoas group? What is the innervation to the quadratus laborum muscle?